When withdrawing funds from PayPal I was not charged any withdrawal fees. Are you seeing any fees when trying to withdraw from PayPal? But has anyone saw these charges by ICICI. I spoke to the manager too. They said there is no way to avoid that charge. LOL. I have an ICICI bank account but have never used it to receive money from PayPal and so cannot comment on it. We get money from our clients to PayPal in India using regular PayPal payments. Then we go to PayPal and withdraw to bank account. At that time ICICI charges Rs. 600 for every withdrawal. 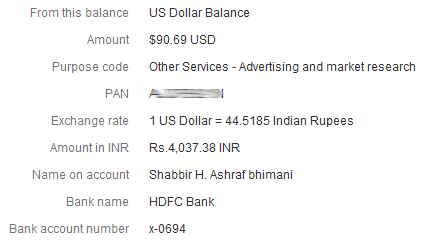 I think the charge is from ICICI not PayPal. If they charges 600 INR for this you should be getting an account in HDFC, SBI or SCB where I have my account and I don’t pay anything for money received from PayPal. Here is what we do. We receive money in $$ from foreign clients. May be you are getting money to PayPal converted to rupees already? I have to check the type of account in ICICI. Are you getting direct wire transfer from clients? Is PayPal doing wire transfer to your accounts? When we used to withdraw money to ICICI from paypal, every time they charge Rs. 600. Do you all pay that fee? I was trying to move away from ICICI to SBI or some government banks bcos of this fee. Please share any info you know about this Rs. 600 per transaction fee. No ICICI does not charge any fees to me because PayPal sends money as inward NEFT payment and that is free for my account. What type of account you have in ICICI? Might be 5-7 days as mentioned by Paypal for transfer is not yet over !! But, how come Paypal say “Transfer Complete”, before amount not deposited in bank ?? Could not understand…. The complete status is from the PayPal end and it may actually get credited to you bank depending on the banking holidays and other delays. The analogy could be like check where you have clearance in progress type of thing. Thanks for the answer. In paypal, it is showing as Comepleted. Wait for couple of days and if you still don’t get it till Wednesday you can raise a concern in PayPal. I have very strange issue. I had $160 balance and when today i login, it shows $0 and says its withdrawn to my account before 2 days. In my account, its not credited. Infact, some Rs. 700 charges are fined. Any idea?? I dont want to loose around 7000 rs. Rohit, What is the status of your transfer? Is it completed or pending. If completed expect the money to get deposited withing 2 working days. 700 Charges is showing in your bank account or in PayPal? I have’nt opted for autowithdraw, but they suddenly started it on my account. Now I want to cancel that but no button for that. How to do this? Not possible to cancel it. As of now we can only change auto-withdrawal bank account but not stop it. Once you provide the details about bank and purpose code it should become active. This is kind of bit tricky. It suddenly auto withdrew from my Paypal account without informing me. Any balance will be auto sent to bank account. everyday? Yes Mita, they will send any balance to your bank account everyday. Today My Auto Withdrawal Option was Activated and got an email – Your PayPal balance was automatically withdrawn on 13-Sep-2011. As per rules of Reserve Bank of India (RBI), NO Indian user is allowed to maintain any type of PayPal Balance Online and the User has to transfer the money to his/her primary Bank Account within 7 days. After 7 days the Amount received will be transferred back/bounce back to the sending merchant/service/user! In order to tackle this problem, PayPal has enabled Auto Withdrawal Feature exclusively for Indian Users. Is this auto-withdrawal only for professional accounts/ also for personal accounts ? It is still not active for everybody. I talked with the PayPal people and sooner it will become active for everybody. According to paypal,those who have enabled auto withdrawl option will get funds to their accounts daily.How can this be possible? Why you think it is not possible? Every payment that you have got will be auto withdrawn at the end of the day.